When mounting your retractable awnings it’s important to understand that retractable awnings may look easy to install, but in fact they are composed of various complex components that require precise and professional installation services. Let Weather Armor in Columbus show you how professional installation can give you durable and stable retractable awnings. To get your retractable awnings project started, you’ll need to tell us at Weather Armor where you want your new home improvement added. Retractable awnings are beautiful additions that can add beauty and functionality to your home. To get it installed correctly, we will need to know a few things first. Retractable awnings can be installed in four different places in your home: on the wall, on the roof, on a soffit (or eaves), and on the fascia (or the roof structure between the gutter system and the soffit). Get your retractable awning’s height. Your retractable awning must be at least 8 feet from the ground, depending on level elevation, and how far your awnings would project, or extend. If your retractable awning is to be mounted over a swinging door, add another 10-12 inches for clearance space. Know your retractable awning projection length. It is important to consider how far your awning should extend, or project, to ensure that the frame system still has optimum strength to support the awning fabric and stand against wind shear and sudden changes in weather. Your Weather Armor retractable awning specialist will be able to aid you in calculating the appropriate lengths to maximize your awning space. Note your awning hood requirements. An awning hood is a hard protective covering that shields the retracted awning fabric from water, insects, birds and mildew (when in the rolled up position). This is especially crucial for protecting your awning’s motor from water seepage and damage. Make sure to leave some clearance space for your awning hood. Plan and prepare awning measurements or area estimates. You need to know the area of awning projection, or how much space your new retractable awning may require. In doing so, you’ll be able to anticipate if there are any obstructions in the way which may not allow your awning to extend properly. This knowledge will also allow you to revise your plan to overcome these challenges. If you are limited by location or structural considerations, now is the time to resolve these limitations with your Weather Armor retractable awning expert. Consider retractable awning mounting alternatives. Finding the height, elevation or location a challenge? Ask your Weather Armor specialist for advice on how to mount your retractable awning in the area of your choice. Consider part of your outdoor ceiling or an overhang as an alternative, or even free-standing retractable awnings. Weather Armor carries a complete line of retractable awnings with modern designs like freestanding retractable awnings that may be custom designed to fit and suit your home’s space. We carry the most trusted brands like Eclipse Awning Systems, Rolltec Awnings, and SunSetter Awnings, so you can be confident of choosing high quality products and accessories to fit your specific needs and requirements. Each retractable awnings manufacturer will have their own hardware, brackets and accessories, and specific directions for installing awnings. This is why Weather Armor has a ready team on hand to aid you in the proper and precise installation of your new retractable awnings. Our factory-trained professional installation specialists ensure the proper mounting of your retractable awnings. Our installation specialists are fully qualified and experienced to help install your awning on any mounting surface. For deck and patio spaces, Weather Armor presents the modern development in the market today -- freestanding retractable awnings. 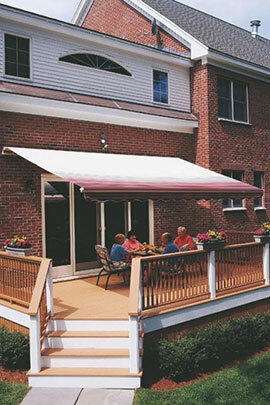 This modern awning system mounts directly on a solid base surface and comes in either motorized or manual operation. It is a great option for outdoor dining areas and home spaces with no ideal surfaces for mounting. Weather Armor is best known for its excellent customer service and professional installation expertise. We carry three of the most trusted retractable awnings manufacturers in the market today namely, Eclipse Awnings Systems, Rolltec Awnings, and SunSetter Awnings. We make sure that your specific needs and requirements for your new retractable awnings are answered, no matter how difficult or challenging the installation circumstances may be.